4 & 1/2 more school days until summer break! I'm a little excited, can you tell? I worked a lot this year and felt super busy all the time. I like to stay busy and have a full calendar, but this year was a bit too much. On Memorial day me and my 7 year old, Casey, sat in the garage and talked out a list of all the things we want to do this summer. I realized that I definitely needed to write it all down to make sure it stayed fresh in our minds and didn't get put on the back burner by other distractions. So where better to write it than on our kitchen wall where it will remind us every morning during breakfast?! I plan on keeping it up all summer and crossing things off as they happen. And definitely adding to it as we think of more fun things to do together! Time sure does fly, but as long as I can look back and say "we had fun and didn't let busy schedules keep us from being together and making memories" than I will be okay with it. I want to enjoy every minute of this season of my life so that when the next season comes I will be ready to enjoy it. My May Goals had a bit of a theme to them this month. Obviously, it was the outside of our house. You probably just figured it's the beginning of Spring/Summer and Heidi just wants to start the season by finishing all of the outdoor work, right? Well there was another reason. A secret reason. My mother in law and us kids were throwing my father in law a surprise 65th birthday party, in our yard!! The pool deck is 100% done and I've already written my review of Deck Restore but I wanted to wait until the pool is open and blue again before taking my beauty shots :) The playset only got one coat of solid stain and scattered storms have been going on for over a week keeping me from finishing. But it looked nice enough for the party and I'm excited to finish it up soon. This month is flying by. We've been working our tails off on all of our May Goals but aren't quite ready to show off the results. Except for one, the front door!! I'm SO glad that I took my time with this decision. If I had painted the front door last summer it would have been tan or green. Those are my safe colors. Blue is definitely not a color I have used much while decorating this house or our last house. But I've been trying to change things up and step outside my color comfort zone, and I'm so glad I did! Also, I looked up and down my street at all of my neighbor's doors and noticed a lot of black, white, green and tan. I wanted my house to stand out and a beautiful blue door will definitely help! This color is called Blue Suede and is a Martha Stewart color from Home Depot. I had them mix it for me in an outdoor Glidden paint in semi gloss. I used only a brush to paint the door and it only needed 2 coats. An hour in the morning and an hour in the afternoon and I was done! I ordered some house numbers for the door too. Our house actually has no house numbers and our mailbox is at the street along with our neighbor's. I've had many confused pizza delivery men at my door over the years and am glad to finally help everyone out! I finally painted the front door! But this week is looking promising!! I decided that if I couldn't paint the outside of the door I'd at least do the inside of it this past weekend. Here's how it looked before. Please, try not to be overwhelmed by how beautiful it is. Okay, now that you've recovered I'll tell you about it. I got a 4 panel door in an effort to be different because all of the houses around here have 6 panel doors. I would have loved to have a window at the top but windows made it more expensive and we really do get plenty of light in the living room. That wood door to the right of it is our coat closet. It's the last door on this floor of the house that needs to be replaced. It's not a very big closet, but just the fact that I have a coat closet makes me very happy. Living without one for the first 4 years of our marriage drove me crazy. I painted the door in Behr's Ultra Bright White which is what we used on all of the trim and wainscoting in our house. First I taped off the hardware, hinges and rubber weatherizer thing at the bottom. I was really excited to get some great family shots so that my new camera felt like something for the whole family instead of just for my blog. When we left Chicago it still felt like winter, but when we got home it was suddenly Spring!! Our flowers and bushes had suddenly bloomed all of the trees had buds and even leaves, the yard was lush and green and nicely mowed thanks to a wonderful neighbor! 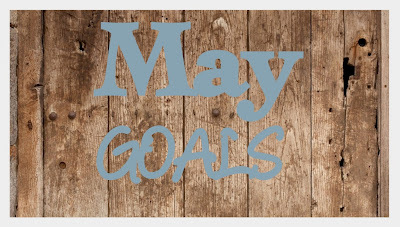 So that brings me to my goals for the month of May. This month in addition to working on some furniture I would like to focus on the outside of our house. We worked long and hard on it last Spring but never finished. I'll give you a review of how the Deck Restore is working out for us and also we'll be painting all of the lower lattice white. Last Spring we power washed it which removed most of the old finish but then we never finished it by reapplying a new finish. I think it's going to be the same color as the deck but the jury is still out on that one. We had a new door installed a year and a half ago and to save on cost we decided to paint it ourselves. It just hasn't happened yet! That color swatch on the door is Blue Suede by Martha Stewart. The jury is still out on that one too.